Tallboys Breakfast AF opened in July 2017 at 600 N 4th Avenue. Taking over the Pancho Villa’s Grill location. Tallboys Breakfast AF brings an eclectic atmosphere to diner food. First, Why “Tallboys” for a name? Simple, they have a huge selection of Tallboy beers. Tallboys are 24 OZ cans of beer. Tallboys are bigger than the Deuce Deuce bottle with, you guessed it, 22 OZ. And the Pounder with – yep – 16 OZ. Why is a tallboy better than either the deuce deuce or the Pounder? Again, simple. It has more beer. And at Tallboys, there are over 50 available. Not to mention local brewed craft beers and hand crafted cocktails. But wouldn’t you know it? One of the more popular beverages is a non-alcoholic Brazilian Ice Water. Tallboys doesn’t look like much from the outside. A boxy white building with a door. Inside you will discover a clean and trendy place to have breakfast and a beer. The interior is comfortable and unique. Peach pink walls with a sage ceiling and borders, ocean blue leather booths and bar stools. And an exposed brick accent wall with liquor bottles on open shelving. Serving breakfast all day and into the wee hours of the morning. There are lunch options available, of course. 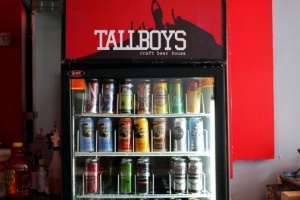 Tallboys is a short walk from the U of A. And the feeling is it will be a popular spot after late night study sessions. And even before or during study sessions. Almost everything in the kitchen is from scratch. And with a local flare. Breakfast sandwiches to luncheon salads give you good food at reasonable prices. The menu features bites and bowles such as potato tots with cheese. Or you can order Tallboys style tots. Tots with cheese AND green chiles, bacon, and crema on top. This is diner food with a flair. There are also some interesting variations on breakfast favorites. Give the goat cheese, lox, egg, and balsamic-topped toast at try. With a tallboy, of course. For the burger lovers, there is the BAT-LEG burger. Yes, it is hard to get the legs off a bat. But in this case BAT-LEG stands for the ingredients. Bacon, Avocado, Tomato, Lettuce, Egg and Goat cheese. And, get this, you can get crushed ice in your drinks and RC Cola on tap! I know, RC Cola. Would you believe it?